Chaos was embraced again in week 3, as both double-digit underdogs went down at home, while New England lost consecutive games for the first time since 2015, the latter of which to a Detroit Lions team that was winless going in. The Bears lead the NFC North, the Dolphins the AFC East, the Bengals the AFC North, and the Titans the AFC South. 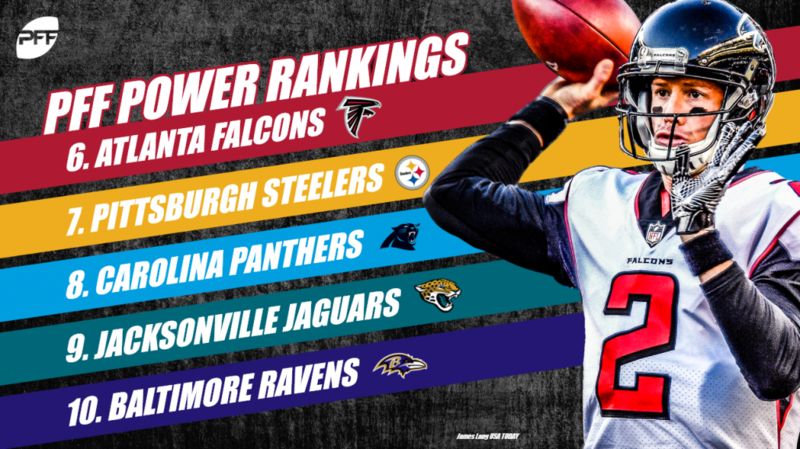 Even after a rough night against the Steelers, the Bucs remain atop the best division in football, the NFC South, in a three-way tie with the Falcons, Saints, and Panthers. Will order be restored in week 4, or will we continue to see the apple cart upset? Like all ELO systems, PFF ELO is an iterative system that updates each team’s rating after each game based on two things: how well they played against their opponent and how well they were expected to play against their opponent. 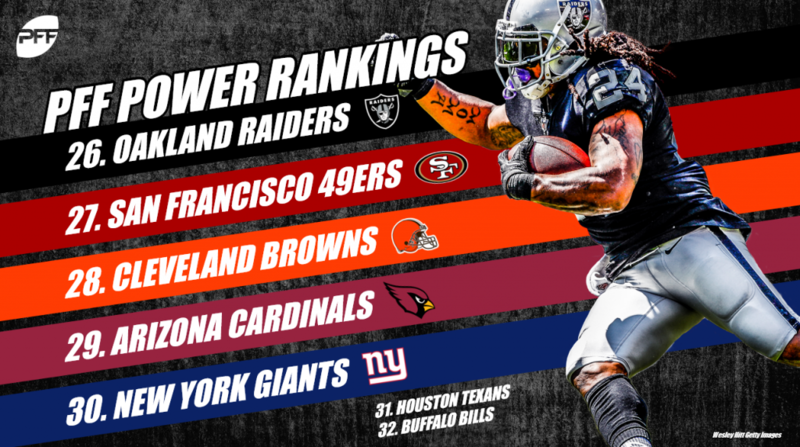 The PFFELO rating system measures the former using our unique offensive, defensive and special teams grades, while the latter is determined by the PFFELO ratings leading up to the game and where the game is played. For example, a favorite heavy playing at home is expected to outplay the visitor, so a victory would result in only a small rise in their PFF ELO rating and a similarly-small decrease in the defeated team’s. But if an upset were to happen, the visiting team would see their PFF ELO rating rise substantially, and the home team’s see a similarly-sized drop. Note: For week 4 we’ve adjusted the ratings slightly to incorporate the return of players like Aaron Rodgers to the Packers from injury, as well as the injury to Jimmy Garoppolo. These adjustments will be rare but will reflect the output of other quantitative models we use as a part of Greenline – in which PFFELO is just one. Carson Wentz returned to lead the Eagles over the Colts at home. Wentz performed well under pressure but struggled from a clean pocket. Putting aside their struggles in Week 2, the Eagles pass defense has played exceptionally well. If they can continue to generate pressure on almost 40 percent of their opponent’s dropbacks, they will be tough to beat at any point this season. Sean McVay has the Rams hitting on all cylinders to start 2018. They are currently our second most likely team to win the Super Bowl and favored to hit their over 10.5 win total. Jared Goff has made a positively graded throw on 34 percent of dropbacks and generated an EPA of .33. 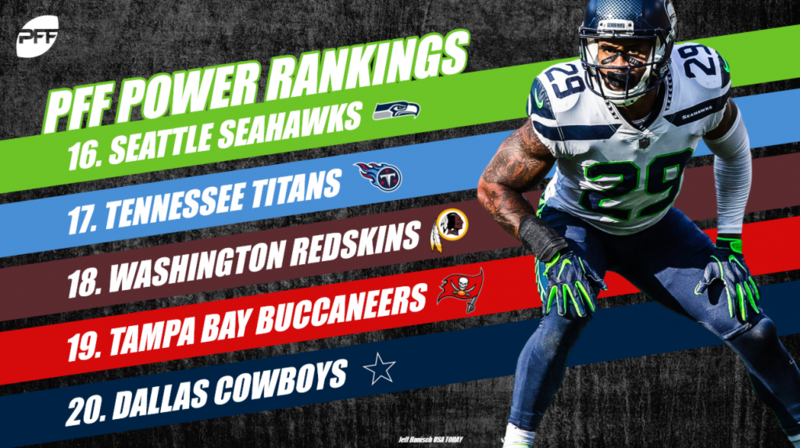 Their pass defense has been phenomenal so far, allowing a successful early down pass on under 38 percent of attempts – the best mark in the NFL. New Orleans has the hardest remaining schedule in our model. Due to this, they are currently dogs to hit their over 9.5 win total. Their passing offense is as good as anticipated, throwing a successful pass on almost 70 percent of earl down attempts. As they showed in Week 3, even when they are down on the road, quarterback Drew Brees is absolutely capable of leading them to a come from behind cover victory. The Chiefs currently have one of the easiest schedules (28th) in the NFL and the highest projected win total (10.83). This was a similar story last year, where they got off to a 5-0 and 6-2 start before falling off a bit mid-season. Will the league figure out Patrick Mahomes (who has a 7.8% : 0% big-time throw:turnover-worthy play ratio), or will Andy Reid continue to spin this yarn up and through the playoffs? What a compelling team. 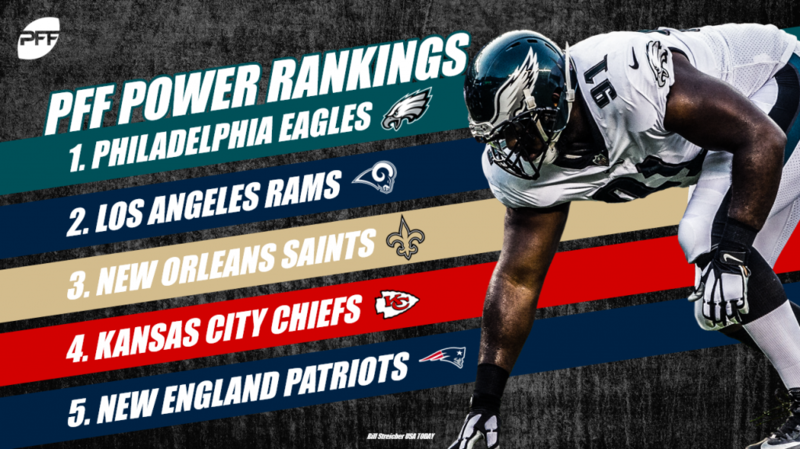 The people get their wish – the Patriots are no longer a top-2 team in this rating system. They are surprisingly behind the Dolphins now in odds to win the AFC East via our simulations, but are still a top team in terms of odds to win the Super Bowl, demonstrating that – if they can get going – they still have the goods in Tom Brady and Bill Belichick to make something of this season despite the slow start. What a frustrating Sunday for the Falcons. They got something close to a perfect game from Matt Ryan (151.3 passer rating when clean), a breakout 7-146-3 performance from Calvin Ridley, and another good performance in the red zone Sunday against New Orleans. It wasn’t enough, as their defense continues to allow underneath passes to kill them, evidenced by the 158 yards after the catch that they yielded to Alvin Kamara and Michael Thomas. This will need to improve for them to be a real contender. The Steelers have played good football for stretches of all three of their games, but they have not yet strung an entire game’s worth of solid effort in all three phases. 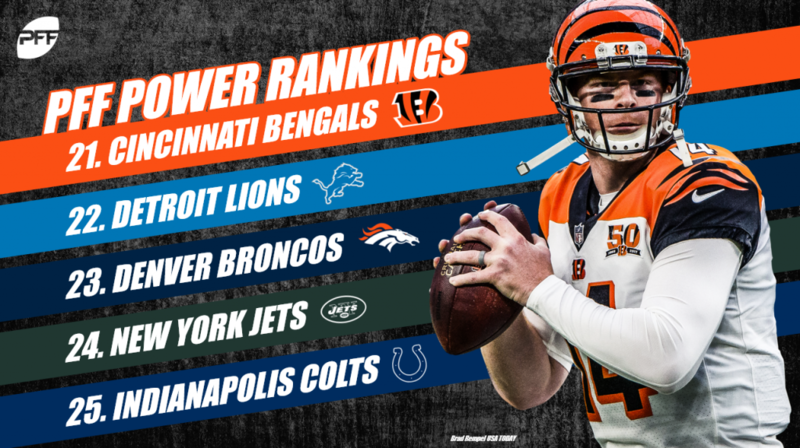 Additionally, when looking into the future, they have the most difficult schedule in the AFC moving forward, putting their chances to win a suddenly-formidable AFC North in question unless Big Ben can improve on his 4.6%: 4.0% big-time throw: turnover-worthy play ratio in the coming weeks. Cam Newton has graded well to start 2018, and at 2-1 the Panthers are slight favorites to hit their over 8.5 win totals. Cam is off to his best season ever from a clean pocket posting a passer rating of 119.8. He has also expectedly performed well running the ball with 4.18 yards after contact per attempt. However, the Panthers pass defense needs to improve if they want to embark on a deep run in the playoffs. After beating New England in Week 2, the Jaguars showed more of who they typically are in Week 3. Blake Bortles is closer to the quarterback who is neutral to negative from an EPA standpoint and not the quarterback who walked out of New England with a per dropback EPA of .36. This defense, although very talented, has yet to perform to the level they played at in 2017. This is concerning if Bortles is asked to do more to win games, only time will tell if he is able to. The Ravens rebounded from a disappointing Week 2 loss in Cincinnati by shutting the door on a Broncos team with high hopes coming in. Those hopes were largely dashed by the Ravens edge players Terrell Suggs, Za’Darius Smith and Matthew Judon, who created four sacks, four hits and seven hurries on the day. In what was one of the biggest upsets in modern NFL history Sunday, the Vikings were blown out at home against a listless Buffalo team with a maligned quarterback. The biggest surprise was their inability to figure out a Bills defense that had allowed 78 points the first two weeks. Tackle Riley Reiff allowed 12 total pressures himself, while guard Mike Remmers surrendered eight on the interior. Thursday will be a big test, followed by another in Philly. Will a slide continue? After two losses in three weeks, the Chargers have the league’s easiest schedule moving forward in terms of PFF ELO. They often seem to defy these advantages, and the Chiefs are still roughly 75 percent to win the AFC West. However, if Philip Rivers (who is generating 0.29 EPA per dropback) and their talented defense can get going and get healthy, they can easily get into the playoffs in a weak AFC. We’ve had a difficult time with the Packers since last season’s data was difficult to use without Aaron Rodgers. However, two close games and a relatively-poor showing in Washington might make us believe that this team is a middle-of-the-pack group with a hobbled Rodgers. 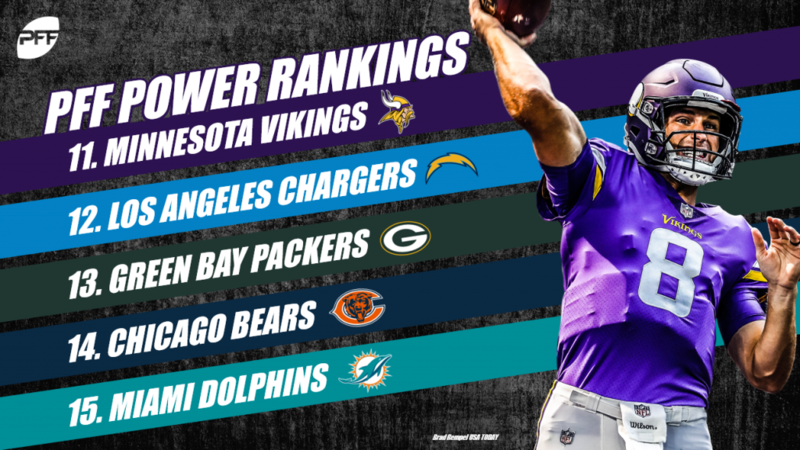 They get some relief (relatively to Minnesota) in terms of strength of schedule moving forward (15th to fourth), so rumors of their divisional demise are certainly premature. I think we learned a few things on Sunday in the desert, and one of them is that any team with Mitchell Trubisky (who has roughly 35 percent more negatively-graded passes than positively-graded ones) should be favored with extreme caution on the road, even against a team as… in development… as the Cardinals. Beating a 2-1 Tampa Bay team would keep this Bears team in first place for another week, and would likely require a big game from the second-year signal caller from North Carolina. Miami is currently slight favorites to win the AFC East with a 3-0 record and a two-game lead over the defending champions, the New England Patriots. Ryan Tannehill has been very good in returning from over a year off, generating a positively-graded throw on over a quarter of his passes, and allowing his speedy receiving corps to shine. Anyone who bought into a Seattle OVER 7.5 ticket likely breathed a sigh of relief Sunday, when 49ers quarterback Jimmy Garoppolo went down for the season with an unfortunate knee injury. While this Seahawks team is certainly a flawed bunch, they still have Russell Wilson making big-time throws on eight percent of his dropbacks through three weeks. With one of the oddest starts to the season, it is surprising to find the Titans at 2-1 after beating Jacksonville 9-6 in Week 3. Marcus Mariota returned, and as expected, struggled against the Jaguars defense. He has yet to throw a big-time throw in 2018 and sports an EPA per drop back of -.29. Alex Smith and the Redskins are off to a 2-1 start after beating a very good Packers team at home. Their pass defense deserves a significant amount of credit after generating a -.23 EPA per drop back in Week 3. They have now allowed a successful pass attempt on only 38 percent of early downs. Considering Josh Norman has graded average to start 2018, this coverage unit is off to an incredible start. The Ryan Fitzmagic experience lost its mojo in Week 3, and while Jameis Winston returns from suspension this week, that still won’t help this coverage unit. In pass defense, the Bucs have allowed a successful early down play on just shy of 60 percent of attempts and they have allowed the second-highest passer rating in the NFL. Expect a lot of shootouts for whoever is playing quarterback for the Bucs. The Dallas Cowboys struggled again offensively and failed to keep the game close against the Seahawks. Dak Prescott’s performance through three games is beginning to be alarming. He has thrown only two big-time throws and currently has an EPA per dropback of -.29. Their defense has played well though and kept them competitive in games. They need to continue this performance with Sean Lee sidelined. After two convincing wins against AFC opponents, the Bengals traveled to Carolina but fell short to the Panthers. Their passing unit continues to be undervalued, as Andy Dalton has generated an EPA of .12 on dropbacks. An impressive 27 percent of his throws have been positively graded, and he has just shy of double the amount of big-time throws to turnover-worthy throws. Their defense isn’t the class of the league but continues to be efficient against offenses on early downs. The Lions secured their first win for head coach Matt Patricia against his former employer in dominating fashion on Sunday night. Their pass-blocking graded exceptionally well as Matt Stafford was efficient from a clean pocket posting a passer rating of 122.3. Defensively, they continue to play well in coverage allowing an EPA of -.02 on early down passing attempts. The Case Keenum experiment in Denver is struggling at the outset. Through three games, Keenum has thrown five turnover-worthy throws, and his 77.8 passer rating from a clean pocket is simply inadequate. The Broncos pass defense has been worse than expected and has allowed a successful pass on 57 percent of early down attempts. This is not the dominant coverage unit it once was with Adam Jones, Bradley Roby, and Tramaine Brock all grading poorly in coverage. Sam Darnold has now graded poorly in two of his first three NFL starts. In his three games, 21.8 percent of his pass attempts have received a negative grade, which is the second-worst mark in the NFL and the Jets’ EPA on pass attempts is the lowest in the league at -.39. The passing offense is not playing well, and the running game doesn’t generate much success either. The Colts played a hard fought game but eventually fell short on the road to the Eagles. Questions continue to be asked about Andrew Luck‘s arm strength after Jacoby Brissett was called upon to throw a hail mary. Luck’s career aDOT numbers have been discussed, but his average depth on completions is even more drastic, ranging in the sevens for 2015-2016; now dropping to 3.6 in 2018. This is by far the lowest rate in the NFL. Thankfully, this team has one of the easiest remaining schedules (31st) but will only go as far as Luck is able to take them. The beginning of the Jon Gruden era in Oakland has not stood out as a rousing success. Derek Carr has been atrocious when under pressure and has posted a passer rating of 32.1 on pressured attempts with four interceptions to boot. Their pass defense is currently the second-worst in the NFL from an EPA standpoint. Gruden’s grinders need a pep talk if they are going to pick up their first win soon. It was an incredibly tough loss for the 49ers in all aspects on Sunday. Losing Jimmy Garoppolo to a torn ACL puts this offense in shambles. Their defense is not grading like a unit that can win a team football games in the NFL. Add it all up, and it is turning into an ugly season, as key offensive contributors continue to go down with injuries. It is officially Baker Mayfield season in Cleveland. After leading the Browns to their first victory in 635 days, optimism suddenly reigns supreme. Mayfield was effective posting an EPA per pass attempt of .36. Over 50 percent of his pass attempts received a positive grade. Their coverage unit also has the second lowest EPA allowed per early down drop back in the NFL. The future is suddenly bright for the Browns. It took three games, but Sam Bradford finally threw his first two passing touchdowns of 2018. However, it wasn’t enough to hold off either the Bears or Josh Rosen. With Bradford posting a passer rating of 83.1 when kept clean, this should be an easy decision to hand this offense over to Rosen. The Giants took care of business on the road against the Texans in Week 3. Eli Manning played exceptionally well from a clean pocket, posting a passer rating of 143.9. Eli’s ‘Big Three’ of Odell Beckham (88.9), Sterling Shepard (78.2) and Saquon Barkley (90.5) posted great to elite receiving grades. Combined, Eli was 20 of 21 for 224 yards with a passer rating of 141.8 when targeting these three. Deshaun Watson had his highest graded game of 2018 against the Giants in Week 3 but has not yet connected on the explosive plays that this offense was generating in 2017. Just under 18 percent of his attempts have been targets 20-plus yards downfield, but he has a low accuracy percentage of 38.5 percent on those throws and has tallied three interceptions as a result. The return of Will Fuller V offers hope; Fuller has a passer rating of 148.8 when targeted in 2018. Josh Allen and the Bills shocked everyone by beating the Minnesota Vikings at home as 16.5 point underdogs. So far, Allen has the highest percentage of incompletions on passes deemed catchable and ended up doing the damage with his legs, as he rushed for two touchdowns. Lorenzo Alexander and Jerry Hughes lived in the Vikings backfield forcing a combined 22 pressures in week three.